The Bodleian Library in Oxford has completed a project to make 25,000 early English books available from on its website free of charge. Dating from between 1473 and 1700, these volumes have been made available online as part of its Early English Books Online Project Text Creation Partnership (EEBO-TCP). The coverage of these volumes included both fiction and non-fiction works. The texts released include works by Shakespeare and Milton and incorporates transcribed versions of some of the earliest printed works in England. Non-fiction works include texts on such diverse subjects as witchcraft, sword-fighting and cooking. In light of the projected increase in the frequency and intensity of disasters associated with climate change, the number of people displaced in the context of disasters will inevitably rise. Existing national, regional and international legal regimes, however, currently respond to only some of the protection concerns arising from such displacement. Crafting an appropriate response will demand a cross-sectoral approach that addresses different forms of human mobility and which also recognises the local knowledge, values and beliefs of affected communities. This issue of FMR includes 36 articles on ‘Disasters and displacement in a changing climate’, five articles on ‘Female genital mutilation (FGM) and asylum in Europe‘, and five ‘general’ articles on: Cartagena +30, trafficking for human organs, animals and forced migration, refugee-state distrust on the Thai-Burma border, and sweet tea and cigarettes in Jordan. FMR 49 will be available online and in print in English, Arabic, French and Spanish. 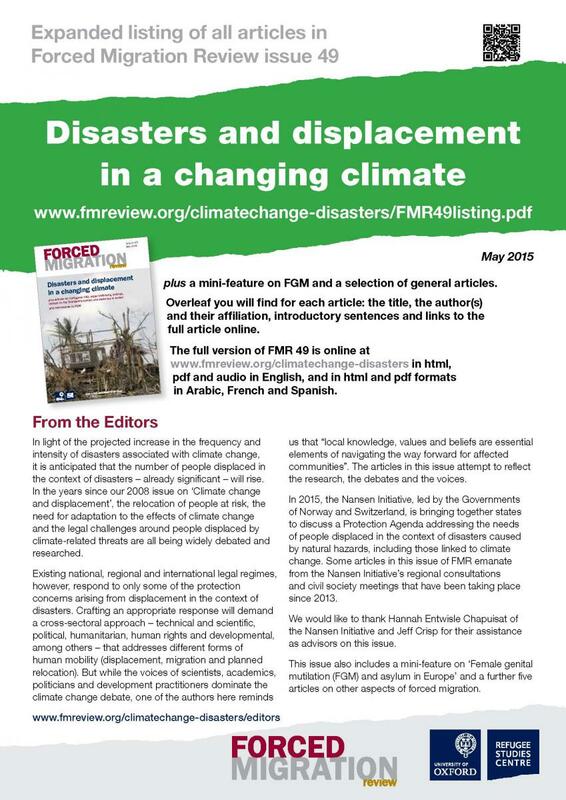 The FGM mini-feature is also available as a separate pdf at www.fmreview.org/climatechange-disasters/FGM.pdf. If you do not regularly receive a print copy of FMR and would like to receive a print copy for your organisation, or multiple copies for onward distribution or for use in training or at conferences, please contact us at fmr@qeh.ox.ac.uk. Details of our forthcoming issues – on ‘The Balkans 20 years on from the Dayton Agreement’ and ‘Thinking ahead: displacement, transition and solutions’ – can be found at www.fmreview.org/forthcoming. 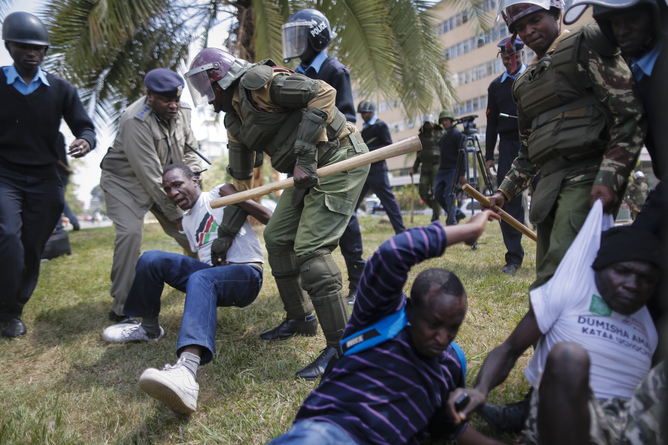 Kenya has passed a controversial amendment to the country’s existing security laws, days after heated debates led to brawling on the floor of the Kenyan Parliament. Despite the fracas, the bill was passed with only minor changes, to the dismay of observers at home and abroad. Domestic and international attention has mainly focused on the impact the bill would have on the period of detention without charge, the tapping of communications without court consent, the erosion of media freedom and the limitations placed upon the right to protest. But the world has paid less attention to the severe implications the new amendments have for refugees in Africa’s second-largest refugee-hosting country. For Kenya’s half a million refugees, many of whom have escaped diabolical threats across the Somali border, this is very bad news indeed. The Security Laws (Amendment) Act 2014 changes Kenya’s 2006 Refugee Act in two vital ways: it seeks to limit the number of refugees and asylum seekers in the country to 150,000, and it further enforces an encampment policy, limiting refugees to the country’s two sprawling, remote camps in Dadaab and Kakuma. The United Nations’ Refugee Agency (UNHCR) estimates that over the next year the current number of 500,000 refugees in Kenya is will rise. With continuing conflict in Somalia and South Sudan, placing strict limits on the number of people who can access state protection will endanger lives. Standing for Parliament: Do Black, Asian and Minority Ethnic Candidates Pay Extra? Introduction: Are British Ethnic Minorities Politically Under-represented? “Tell Them That I Want to Kill Them”:Two Decades of Impunity in Hun Sen’s Cambodia. This 68-page report documents key cases of unsolved killings of political activists, journalists, opposition politicians, and others by Cambodian security forces since the 1991 Paris Agreements, which were signed by 18 countries, including the five permanent United Nations Security Council members. The Paris Agreements and the subsequent United Nations (UN) peacekeeping mission were supposed to usher in a new era of democracy, human rights, and accountability in Cambodia. More than 300 people have been killed in politically motivated attacks since then, yet not one case has resulted in a credible investigation and conviction. “The Law Was Against Me”:Migrant Women’s Access to Protection for Family Violence in Belgium. This 59-page report found three major protection gaps for migrant women who experience domestic violence in that country. Women who migrate to Belgium to join a husband or partner may face deportation if they report the violence during the period when their status is being confirmed, as do undocumented migrant women. And domestic violence victims, especially undocumented women, lack adequate access to shelters. This 58-page report details the final hours of Muammar Gaddafi’s life and the circumstances under which he was killed. It presents evidence that Misrata-based militias captured and disarmed members of the Gaddafi convoy and, after bringing them under their total control, subjected them to brutal beatings. They then executed at least 66 captured members of the convoy at the nearby Mahari Hotel. The evidence indicates that opposition militias took Gaddafi’s wounded son Mutassim from Sirte to Misrata and killed him there. Sampling in an Urban Environment: Overcoming Complexities and Capturing Differences. Gutters, Gates, and Gangs: Collaborative Sampling in ‘Post-Violence’ Johannesburg. By Jean-Pierre Misago and Loren B. Landau. Quantitative Methodological Dilemmas in Urban Refugee Research: A Case Study of Johannesburg. By Darshan Vigneswaran and Joel Quirk. Readmission Agreements of EU Member States: A Case for EU Subsidiarity or Dualism?